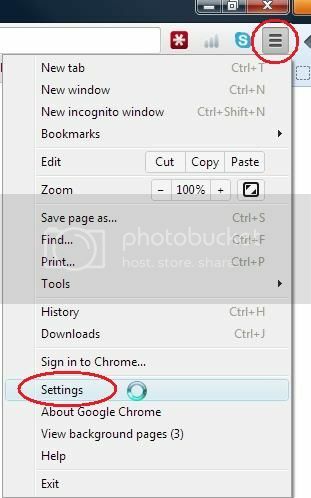 JazHaz wrote: Does anyone know how to use the plugins for Chrome? Try as I might, I can't work out how to do a search. and all you have to do is type in your search term(s) and hit the "Enter" key. 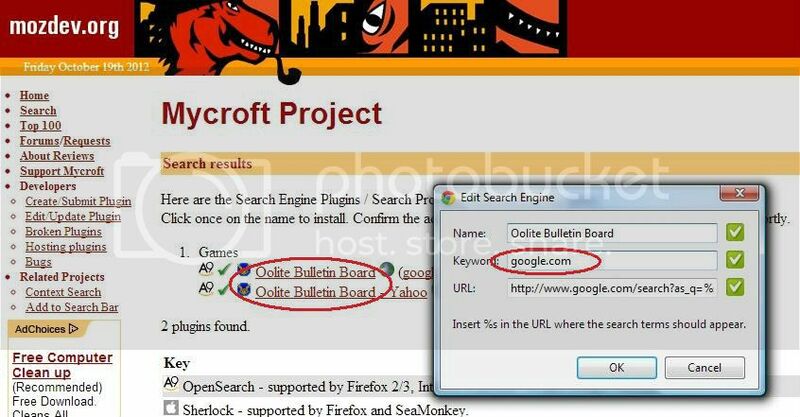 Click on the "Customise" button, (the funny thing with 3 horizontal lines) and then click on "Settings"
Click on "Manage search engines"
Click on the "google.com" or "search.yahoo.com" keyword, as the case may be, and change it to "oolite" instead. Hit the "Enter" key. You're now good to go, as described above, under "USAGE". Last edited by Diziet Sma on Fri Oct 19, 2012 4:43 pm, edited 6 times in total. Wot.. still not stickied? How about it, mods? Diziet Sma wrote: Wot.. still not stickied? How about it, mods? Ahh, it's nice to be back.. I've missed this place. Diziet Sma wrote: Ahh, it's nice to be back.. I've missed this place. Diziet Sma wrote: Thank you, good sir..
Must be the week of comebacks - I've been away for 7 months. Glad to see you back - loving the new Avatar - by the way. Thanks Dizzy. It was indeed the keyword that I needed to change to get the Oolite BB search working on Chrome. All works now, like a dream. Before now whenever I wanted to search the BB I would have to change the default search engine manually, which was a bit of a pain. Now I'm pain-free! A question, Diz - what would I need to add to that search criteria to specify a certain person's post? That's the only advantage the forum search function has. Good question.. I don't think there's a good solution, however.. Some playing with "author=El Viejo" (not in quotes) plus the search term(s) seems to yield fair results though.. although it will also include anyone who has quoted the author. YMMV. If you test it, I'd be interested to learn how effective -or otherwise- you find it. Thanks, Diz - some experimentation with that does help a little. I'll play around with it some more later. Since Safari 5.x does Inquisitor not work without bugs on Safari. 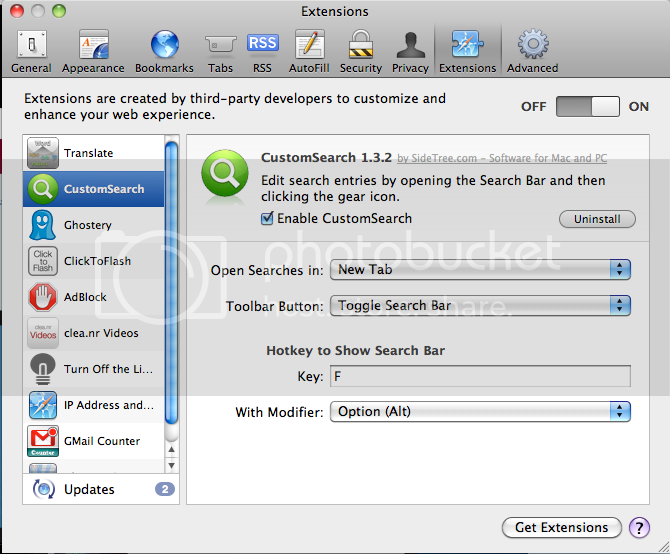 For Safari 5.0 and newer I now use the Safari extension "CustomSearch". This can be found by just selecting "Safari Extensions... under the Safari menu. You see I already filled everything in. I copied the settings from the Wikipedia search and just replaced the site. In the settings you can set the title, if it should get its own button in the menu etc. You can also choose to add it to the contextual menu for very fast selection. More info at the site of the author. Last edited by Eric Walch on Fri Feb 01, 2013 11:43 pm, edited 1 time in total. Thanks Eric. Much appreciated. I've linked to your write-up in the original post. I resurrect this thread in order to say: thanks, Diziet Sma, for the information on the Google search plugin.